I've never been a fan of money. I like the things you can get with money, sure...like crafting supplies, an education, or a good read. And I don't really mind earning money, though I feel supremely lucky that I don't need to command an income presently. But the way that green stuff just twists you up inside with worry sometimes doesn't feel like very nice at all. "I want this, but I shouldn't buy it. I would really like this, but I don't need it. Is this worth it? Is this being wasteful? BUT I JUST WANT IT! I deserve it." Then the credit card or the cash comes out and in a flash that light of instant gratification is turned on. A feeling of warm euphoria wraps its arms around me and pushes up my lips into a smile. It teases my brain saying, "you did good." And then the shopper's-high is gone. And so is the money. 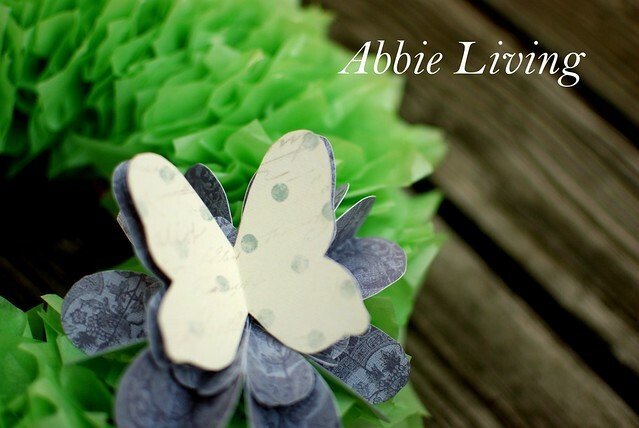 The butterfly and flower adornment are a recreation of my beloved blue hydrangea but you can use any accent you wish. Store bought or hand-made, either will work fine with this simple wreath. I attached a bit of wire to the back of the butterfly, threaded the flower through and then stuck the wire through the foam wreath form to keep it all in place. 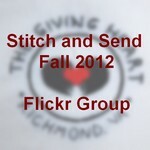 Like most of the projects I love, this job takes some patience and a little bit of time. But I believe time well spent, considering the nifty result. 1. Knot the ends of the ribbon together. 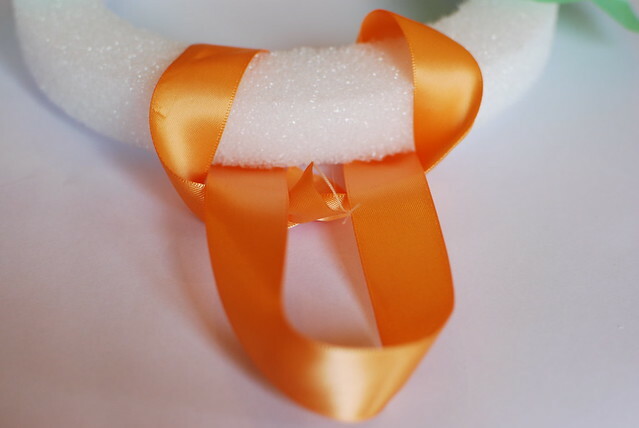 Make sure the ribbon isn't twisted. Fold the circle in half, (so you'd get two length of ribbon side-by-side) and loop it around the edge of the wreath form. 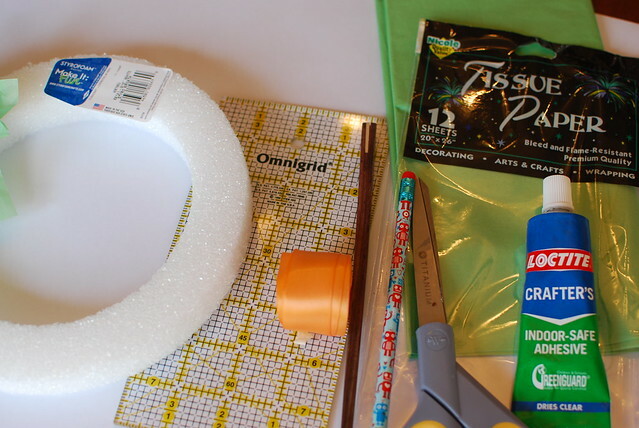 Pass one loop end through the other loop end and affix it all with a dab of glue to the back of the wreath form. 2. Measure with the ruler, and mark with the pen, 3"x3" squares of tissue paper. Cut them out with a scissors. 3. 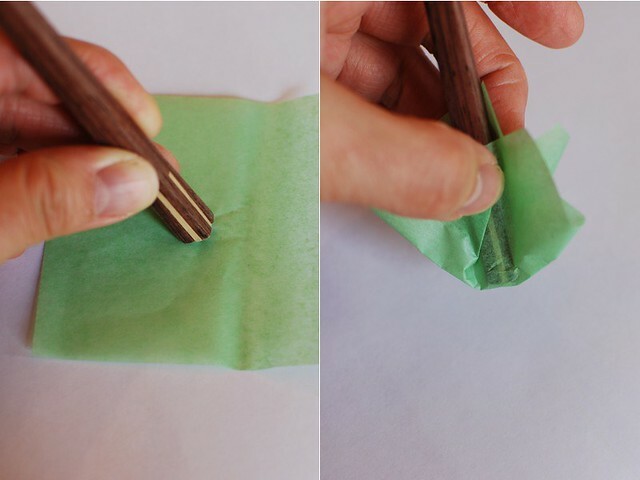 Take the chop stick and place the larger end at the center of the tissue paper square. Gather up the edges of the tissue paper around the chop stick, and set this aside, with the chop stick still inserted. 4. 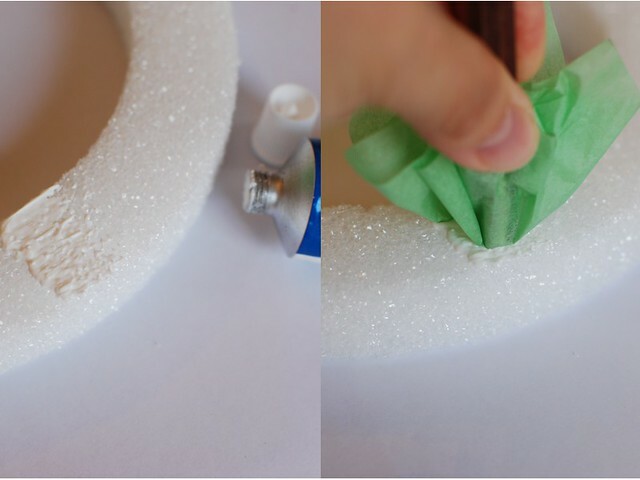 Spread a dab of craft glue onto the wreath form and use the flat end of the chopstick to press the tissue paper bunch onto the wreath form. Remove the chop stick and let the tissue paper stand up. 5. 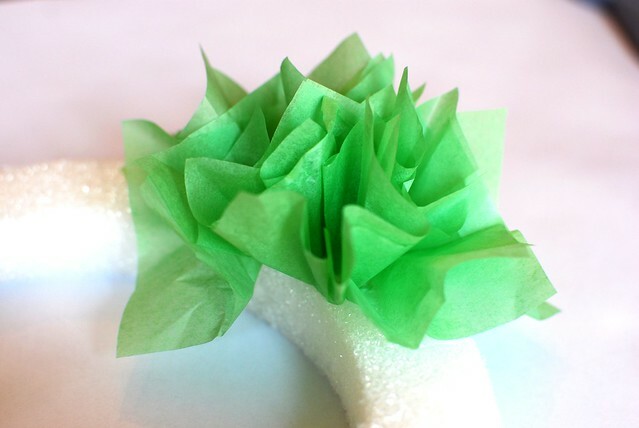 Continue folding tissue paper squares around the chopstick and then pressing them into the glue on the wreath form. Of course, spread more glue as necessary. 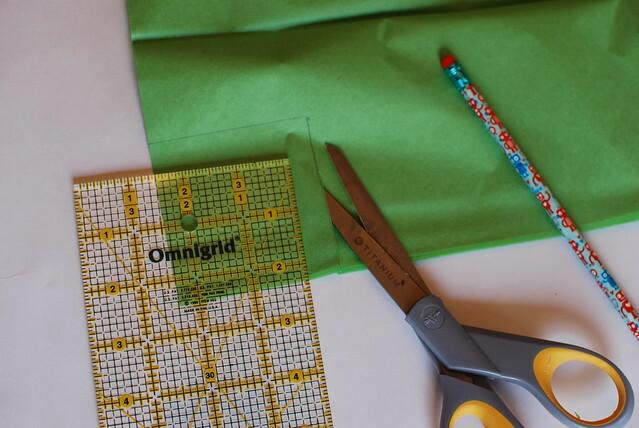 Try not to glue a large area at one time, since the paper bunching takes time and you don't want the glue to dry too much. Bunch the paper together as little or as tightly as you'd like to get a less, or more dense effect. 6. 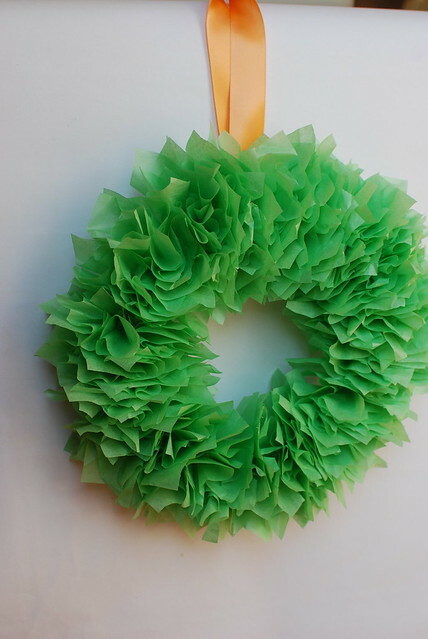 And then you get your basic tissue paper wreath. 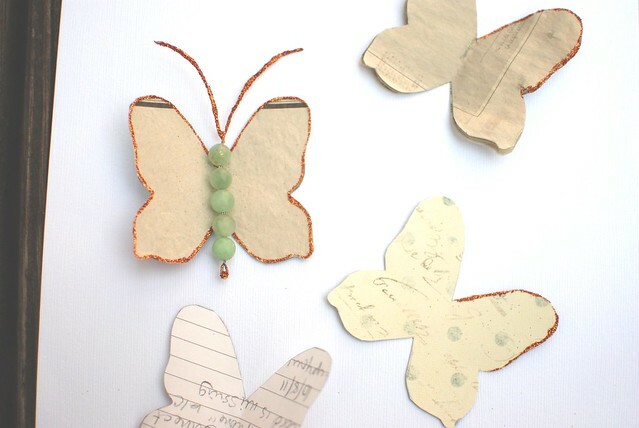 Adorn it with the accent of your choice and hang it up to admire your work. 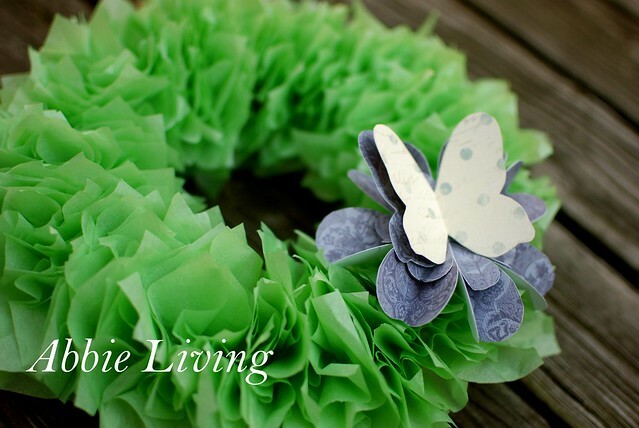 It took me longer to create the butterfly flower accent than it did for me to come up with and shoot the wreath tutorial idea. I dipped newspaper into old coffee to antique it. I did glitter tape and glue glitter. I did beads and wire...and I ended up doing a simple paper motif. Figures. And Sea Mat by Cornflower Blue Studio -- see, inspiration can transcend mediums!